They lack substantially in the education department. And by “substantially” I mean education material is almost non-existent. Sure you have the classic tutorial that teaches you how to open a trade, but that’s about it. There’s something else I have to mention: their slogan is “Growell your Trading”. I turned to Google for help regarding the word “Growell” but all I got was a company name so their slogan doesn’t make sense to me. The owning company Growell Capital (yea, now I know where “Growell your Trading” comes from but it still doesn’t make sense) is licensed by the Cyprus Securities and Exchange Commission (CySEC). Regulation alone doesn’t mean the broker is 100% reliable and professional but it’s a plus nonetheless. Full Review of GrowBinary – Copy-Paste All the Way? In a way it’s getting boring to see so many brokers copy each other. They are all “the best”, “the most innovative platform” or “the leader”… sometimes I think I should copy-paste all my reviews. After all, brokers offer the same thing so why shouldn’t I give the same review, eh? Well, out of respect for you guys, I won’t copy-paste anything so let’s see what this broker has to offer. SpotOption is the name of the game these days and GrowBinary follows the strong trend of using this platform for trading. Ok, that’s not a bad thing as the SpotOption platform is reliable and easy to use; on top of that, GrowBinary chose to offer Ladder style options and the Strategy Advisor. Let’s talk a bit about these features: the Ladder style offers the possibility to increase your profit if the asset price moves further away from your entry/strike price. In other words, if you have entered a Call and price is just a small number of pips above your entry price at expiry time, you win, but the more the distance increases, the more payout you get (good option to use in a strong trend). The Strategy Advisor is a small button on the left hand side of the chart. If you click this button you will be able to choose between RSI, MACD or a Simple Moving Average. 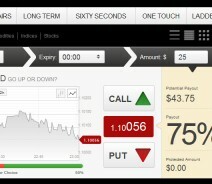 Depending on the chosen indicator, you will get a prediction of Call or Put. I am not sure how that prediction is given but at least it’s a bare-bones version of technical analysis so I believe it’s better than nothing. Don’t expect it to make you rich though. Now that we’ve talked about the trading platform – which is good but that is SpotOption’s merit – let’s talk about the rest of the website: it’s incredibly clunky, it has missing links and overall it was a disappointing experience for me. They say that spending a few minutes a day in their education center will make you a better trader but there’s no trace of such education center. They say e-books will help you improve but I couldn’t find how to download such e-book. Their ultimate argument to make you join them seems to be “Because we are the best!” but unfortunately for GrowBinary, that statement needs to be proven. You are not the best just because you think you are. The website is only available in English and Arabic, it takes ages to load (no, there’s no problem with my broadband fiber optic internet connection) and it has a lot of missing/broken links. Although the SpotOption platform is user friendly, the entire experience is poor. Their asset basket is composed of 12 currency pairs, 19 stocks, 7 commodities and 20 indices. This is more than enough for users to find a good trade and to have a wide variety of options. The expiry times are characteristic to SpotOption platforms, ranging from 60 seconds to 15 minutes, hourly, end of day and long term. One Touch options (with predetermined expiry time) is also available. Information about the commissions charged is not available on the website and live support is not helping either. I can only assume that your e-wallet provider or bank will charge a transfer fee but this differs from provider to provider. The live chat representative was slow to answer and it took me three attempts to receive an answer to a very simple question (twice he answered with a question of his own). My next question was answered with a “Please provide me with your phone number” type of question so it was time to finish our little chat. Effective return goes up to 85% (not for all assets of course). Deposits and withdrawals can be made through wire transfers, credit cards and certain e-wallets (Skrill, Neteller). Minimum deposit is 100 USD and the time it takes for a withdrawal is usually 1-2 days (according to them). Deposits are instant except wire transfers which may take up to 4 days. The Bonus goes up to 100% depending on the deposited sum (and probably your negotiator skills) and the required turnover before being able to withdraw is 40 times the Bonus. However, I recommend asking for written confirmation of these terms before accepting a bonus. Ladder style options are still considered an extra feature because not all SpotOption brokers offer them at the moment. Other than that, I cannot think of anything special.